Amazon’s IMDb app has come a long way in the last 6 months. It received a major UI facelift back in December of last year, and just a few months ago it received another significant update which added global release dates and other new data. 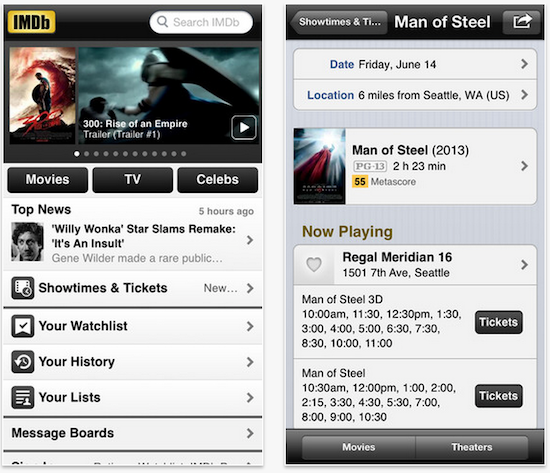 – “Tickets, please!” You can now conveniently purchase movie tickets via the IMDb App (currently US-only). – More bios for celebrities you know and love as well as for up-and-comers. – Want to buy a movie or TV show on DVD or Blu-ray? “Search via Amazon Mobile” to the rescue. Requires that you have the Amazon Mobile app, but we provide a handy link if you don’t have it yet. – Also, did you know you can tap the “Coming Soon” bar above the title on upcoming movies to add the release date as an event to your calendar? – Bug fixes. Nasty tricksy bugsies. We hates them! – We heard you. By popular demand, we’ve updated the movie and celebrity pages to include one-tap access to the full cast/full filmography (which, yes, scrolls vertically). – You’ll see that cute little Watchlist flag almost everywhere now. Tap it to add movies and shows to your Watchlist (and tap-and-hold to add to your other lists as well). I actually really like the new ticket-purchasing feature. As expected, it’s powered by Fandango, but everything is done in-app. Other in-app ticket-purchasing implementations, such as in Siri, forces you into the actual Fandango app to complete transactions. The new Amazon Mobile integration is also nice. Let’s say you want to buy a movie or TV season on DVD/Blu-ray, simply type it into the search bar and select the Search via Amazon Mobile option. You can literally find and buy content within a few taps. The IMDb app is quickly becoming an all-in-one utility for movie lovers—you no longer need other apps like Fandango or Flickster. If you haven’t yet, I recommend checking it out. It’s available in the App Store, for both the iPhone and iPad, for free.